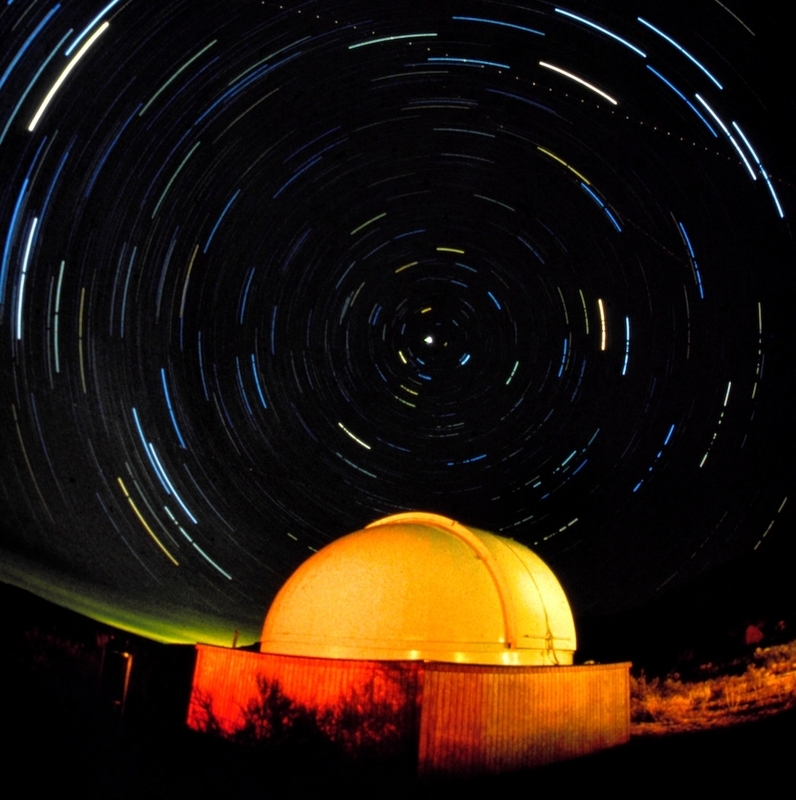 Chaco Observatory, National Park Service. Bernard 33 or Horsehead Nebula taken from Chaco Observatory. NPS. 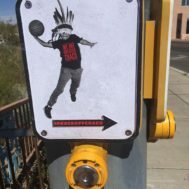 Citing the “administration’s priorities of being a good neighbor and building trust with tribal governments,” the U.S. Department of the Interior Bureau of Land Management (BLM) announced that it would delay a New Mexico oil and gas lease sale near the Chaco Culture National Historical Park that it had scheduled for March 8, 2018. According to the press release on the BLM website, “Secretary of the Interior Ryan Zinke … directed the BLM to defer its scheduled Farmington Field Office lease sale so the agency could complete an ongoing analysis of more than 5,000 cultural sites in the proposed leasing area.” BLM New Mexico Acting State Director Aden Seidlitz stated, “We understand the cultural importance of this area, and the need to gather additional information about this landscape before holding a lease sale.” He promised to work with tribal and state governments. The BLM release explicitly referred to completing “an extensive cultural report” before it pursued “offering parcels for lease that have been deemed appropriate for leasing.” Environmental and cultural heritage organizations had sought a commitment to ensure that the BLM meets its responsibilities under the National Historic Preservation Act, Historic Sites Act, the Antiquities Act, the American Indian Religious Freedom Act, and the Religious Freedom Restoration Act. Twenty miles of difficult dirt road separates visitors from UNESCO World Heritage Site, Chaco Culture National Historical Park. This is not the biggest barrier, though, to public access to the Chaco civilization. Not far outside the park’s 53.09 square miles, the federal government has leased 843 acres of federal lands to oil, gas, and mineral interests for $3 Million, and another proposed sale in March 2018 includes lands less than 10 miles from the park. Critics fear that oil and gas money may become the controlling factor in managing these ancient lands. The designated Chaco Culture Historical Park was at the center of a vast civilization – a part of Ancestral Puebloan culture – that existed for over 300 years in what is now the US Southwest. Chaco Canyon holds the remains of grand kivas and great houses – Pueblo Bonito, Una Vida, Peñasco Blanco and others. It is one of the most significant cultural sites in the United States. The Hopi, Zuni, Navaho and Pueblo peoples of the Four Corners region (Utah, New Mexico, Colorado, and Arizona) all claim ancestral and spiritual ties to Chaco and its connected communities. Chaco was also part of an extensive trade network as evidenced by archaeological finds of cacao and macaws from Mesoamerica, marine shells from the Pacific coast, as well as raw and crafted copper from western Mexico, all of which have been found in the Ancestral Puebloan lands. For example, researchers have discovered cacao residue in the pottery at many sites and a sash made of red macaw feathers that was found in the Abajo Mountains, near Blanding, in what is now a part of the contested Bears Ears National Monument. An interior view of Wijiji, a ruin at the southern end of Chaco Canyon. By Troy Cline (Ancient Observatories: Multimedia Center) [Public domain], via Wikimedia Commons. Although pueblo peoples are said to have a connection to the region that spans thousands of years, Chaco Canyon itself flourished between 850CE and 1200CE. 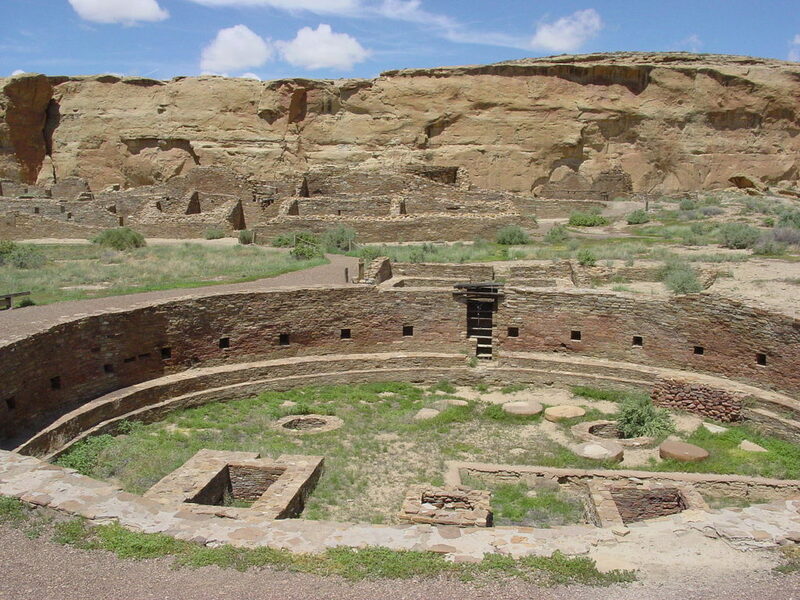 The park’s website states, “By 1050, Chaco had become the ceremonial, administrative, and economic center of the San Juan Basin. Its sphere of influence was extensive. Dozens of great houses in Chaco Canyon were connected by roads to more than 150 great houses throughout the region.” It has been estimated that in the contested Bears Ears National Monument, part of the Ancestral Puebloan lands, there are over 100,000 archeological sites, many connected to Chacoan civilization. An estimated 30,000 Chacoan peoples left their communities within a very short period of time, in what has been called one of “the greatest vanishing acts in human history”. The exodus was most likely due to a long-term drought. The Chaco communities became countless ruins scattered throughout the Four Corners Region. Most have never been inventoried, fewer still have been excavated and researched. The lands surrounding Chaco Culture are rich in energy and mineral resources. For decades the Bureau of Land Management (BLM) has sold leases for oil and gas development in lands beyond boundaries of the national park. According to the Farmington Daily Times, the BLM Farmington Field Office stated that the San Juan Basin has 23,350 active oil and gas wells, more than 16,000 of which are on federally-managed land. In 2017 the BLM auctioned oil and gas leases on 843 acres of land around Chaco to an undisclosed buyer for $3 million. A proposed sale in March of 2018 is said to also contain leases close to Chaco Canyon, some less than 10 miles away. The BLM has promised to prohibit drilling within a 10-mile radius around Chaco, but it appears that the BLM is backing off from that commitment with the new leases. Opponents say that even a 10-mile buffer would not sufficiently protect the cultural heritage within the park, and would potentially allow destruction of hundreds of sites that lie undiscovered outside of it. Oil, gas and uranium interests such as the American Petroleum Institute say such leases are needed to protect U.S. national interests by reducing dependence on foreign energy sources. They see domestic energy production as one way to reduce our reliance on foreign oil. Half of the royalties from oil, gas, mineral and uranium production on federal land go to the states where the production takes place – in this case the states of Arizona, Utah, Colorado and New Mexico – thus creating economic incentives for legislators and officials to back development. Opponents of the leases say that heavy equipment, the development of the extraction infrastructure, wastewater disposal required for mining and drilling all can cause vibrations through the surrounding earth, and even earthquakes, that could knock down the walls of the ancient structures or crush and disrupt unexcavated sites, altering the archeological record and destroying sites sacred to the Native American tribes of the area. The recent increase in earthquakes along the Colorado/New Mexico border has been largely linked to the wastewater disposal from oil and gas production. Tougher Obama-administration regulations on fracking were rescinded at the end of 2017 on Federal and Indian Lands; raising the possibility of even greater damage to archeological structures. The leasing process through the BLM takes into account cultural and environmental concerns; the BLM is required to meet its responsibilities under the National Historic Preservation Act, Historic Sites Act, the Antiquities Act, the American Indian Religious Freedom Act, the Religious Freedom Restoration Act. These, and other federal laws require that the BLM partner with the tribes and consult on how the leases will impact tribal communities. An image of the ruins of Chetro Ketl in Chaco Canyon (New Mexico, United States); shown is the complex’s great kiva. By National Park Service, via Wikimedia Commons. Destruction of ruins and restrictions on access to public lands from oil, gas and mineral production could have a huge impact on the tourism that supports the economies of the Four Corners area. Tourism is about 10% of New Mexico’s economy, and most of that is linked to Native American history and culture – Chaco Culture National Historic Park alone has 250,000 visitors a year. According to an article by Laura Parker, in National Geographic, tourism is an $8 billion industry in Utah and the state’s biggest “export.” Arizona and Colorado also realize significant revenues from cultural tourism. The buildings, equipment and drilling rigs associated with gas and oil exploitation could also create light pollution. Chaco Canyon is designated as an International Dark Sky Park by the U.S. National Park Service – the fourth site to earn this designation. Tourists (and students in the field of astronomy) come to New Mexico and Arizona to study and appreciate the night sky. Drilling and mining sites and equipment working close to the park could also reduce the visibility of the nighttime sky. Native American sacred sites are at risk. The architectural and astronomical features of the Chaco region are said to have created the framework for a system of governance that determined how people related to and interacted with each other, when crops were planted, when ceremonies were conducted and even how trade was conducted. Native American activists say that disruptions to the surrounding landscape, through mining, drilling and fracking, change the relationship of the Native Americans to the land and their cultural and spiritual history by altering and destroying the land features upon which the Chacoan peoples based their systems. In 2017 The National Congress of American Indians has voiced its opposition to further drilling in the Chaco area. Fajada Butte, Chaco Canyon, New Mexico. 14 August 2006. Photo: National Park Service, Wikimedia Commons. 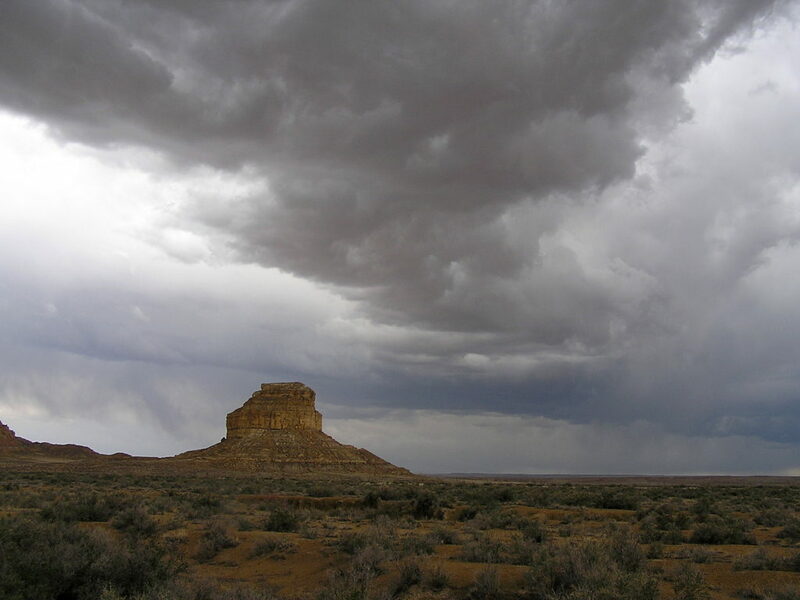 The development of drilling and mining in the region, and the diminishment of national monuments meant to protect areas of cultural significance – such as the 100,000 ruins said to be within the original Bears Ears National Monument – has archeologists concerned that important pieces to the archeological record will be lost to history. 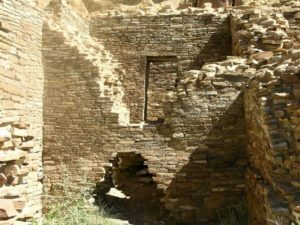 How the Chacoan architectural astronomical societal system functioned within the context of the features of the surrounding land, is one of the puzzles that archeologists have been working on for decades. Although certain pieces of the puzzle may exist in the oral traditions of the surrounding tribes, these may not be made public, leaving archeologists and researchers to work from the archeological record to develop a picture of Chaco cultural life. A well-known example of ongoing research around an astronomical marker is the Sun Dagger site, on Fajada Butte, within the park’s boundaries. During the summer and winter solstice, “daggers” of sunlight appeared on a spiral chiseled in the rock wall behind three stone slabs. The significance of the site is unknown to archeologists, but it is theorized the site was some sort of shrine to the sun. Of concern to both archeologists and the tribes of the Four Corners region is the potential for looting and negligent destruction in unprotected land. For archeologists, the unrecorded removal of objects from their historical context alters the archeological record, creating challenges to understanding ancient civilizations such as Chaco. 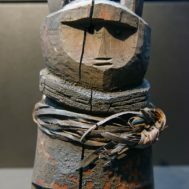 The tribes have a different perspective: they see the unrecorded removal of objects by either archaeologists or mineral development as disrupting their historical and current spiritual connections to the sites, altering their history and destroying current ceremonial use. While the art dealer organization ATADA has put rules in place requiring due diligence that would keep looted materials off the market – anything found on federal land is illegal to sell – oil and gas companies are not as focused on preserving cultural resources and ensuring that important tribal interests are protected. Opponents question whether expanding oil, gas, and uranium extraction make economic sense. Some say that while the current administration may want to reduce its dependence on foreign sources of energy, oil and uranium development may not be the most economical approach. In New Mexico, Governor Susana Martinez’s State of the State address at the beginning of 2017 noted, “In just a year and a half, oil prices dropped 71 percent. That hit us hard. In our highest energy-producing counties, gross receipts tax revenue plummeted. At the same time, GRT rose in every other county … We lost over 11,000 oil and gas jobs.” Governor Martinez’ statement reflects the result of the collapse of oil and gas prices since their peak in 2014. In some ways, Native American communities are moving toward new energies faster than state governments. In light of the abundant sunshine and wind in the Four Corners area, Navajo Nation, President, Russell Begage, signed an executive order in September 2017 implementing plans for a clean energy economy that would include wind and solar as a large part of the Navajo Nation’s goal to reduce dependence on fossil fuels. For many, this is the preferred approach. Protection and development of the cultural resources of the ancient Chacoan civilization, and utilizing energy from the sun that inspired this civilization, may be a better economic strategy than oil, gas and uranium development in the Four Corners region.